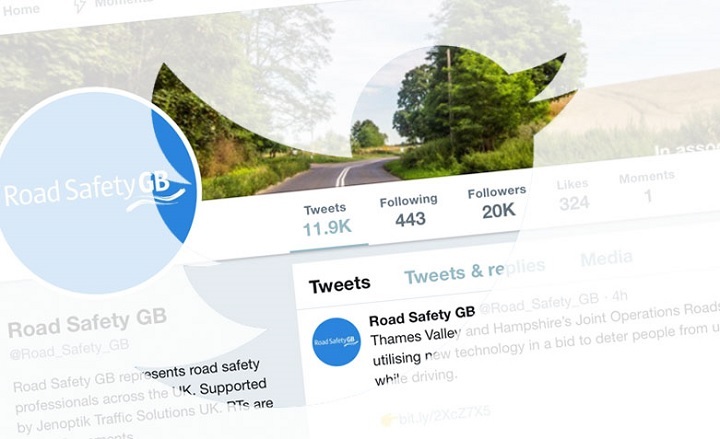 The Road Safety GB Twitter account has reached the milestone of 20,000 followers, further confirming its status as one of the UK’s leading sources of road safety output on social media. The account – which can be found at @Road_Safety_GB – was launched in February 2010 and has since become a key part of Road Safety GB’s online presence. Since June 2016 the account has been sponsored by Jenoptik Traffic Solutions UK. Road Safety GB aims to use its online presence to spread ‘all things road safety’ to the largest audience possible. For example, in March 2019, posts on the Road Safety GB Twitter account had a social reach of more than 147,000. November 2018 also saw the account attract nearly 1,000 engagements – including nearly 500 clicks through to the website. The Road Safety GB twitter feed has considerably more followers than those operated by Road Safety Support (3.3k), Road Safety Scotland (3.5k), RAC Foundation (5.3k), FIA Foundation (6.7k) and IAM RoadSmart (15.9k). Ahead of it in terms of followers are Brake (20.7k), RoSPA’s road safety account (21.6k) and DfT THINK! (27.6k). “This represents a combination of road safety professionals, campaign groups, responsible employers and interested individuals and activists, and is integral to Road Safety GB’s engagement strategy. “The Road Safety GB Twitter feed is used to encourage discussion, share information and flag up important developments and we know that many followers cascade the content – meaning the overall reach could be much higher, nationally and internationally. “In addition to the valuable contribution the feed provides to functional road safety, we shouldn’t overlook the way it enhances the profile of Road Safety GB which contributes to our credibility.